Have you ever wondered if you could survive the invasion of your country by an enemy who was specifically targeting people just like you? I've often thought about this very question. In this award-winning novel, we meet Tasa, a young Jew who learned the hard lessons of survival in war-torn Poland. It was a night like others she had shared with Danik. He came to Tasa's bed after everyone was slumbering and the house beat with silence. The two of them whispered their feelings and fears, relishing the comfort of their stolen privacy. She knew that just before dawn, Danik would rouse himself and leave her to awaken alone, the imprint of his body still fresh beside her, but for now they drifted in each other's arms. Circumstances: Tasa, a promising violinist, and her family must find a way to survive the Soviet invasion, the Nazi invasion, the Holocaust, and a world war. 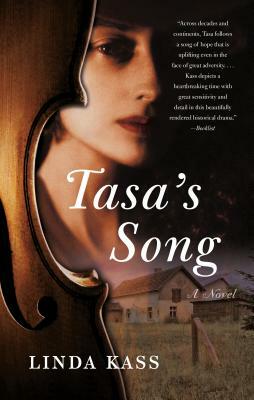 Tasa's dreams of becoming a professional violinist are shattered by the war. Fear and sorrow are overwhelming as family members are deported or arrested. Tasa is initially one of the lucky ones, hidden and protected by family friends. But no one truly escapes the horrors of war. Some things to know: Music fills this book, from folk styles to classical. The story is told mostly through narrative, but Kass also uses letters, songs, and journal entries. Check out the book trailer (embedded below). Awards: Tasa's Song won the 2016 Bronze Metal for historical fiction from the Independent Publisher's Book Awards. Jewish Book Month: I'm recommending Linda Kass's Tasa's Song for Jewish Book Month, which occurs annually in late fall. Because the event is based on the lunar calendar, the date changes every year; this year it begins on November 24. For more information, visit the Jewish Book Council's website. I think that type of book appeals to me because I do wonder things like that. i cant imagine living during WW2 ... certainly not in Europe ... this sounds good, thanks! Sounds interesting. And yes, I've thought about this happening. Scary! I love the sound of this one! Thanks for sharing, and I'm adding it to my list. Thanks for visiting my blog. This does sound the sort of book I'd like! I am so glad books such as this are still being written. I would definitely pick this one up to read. This sounds so good. There is so much amazing fiction set in that time period. For this week's teaser, I chose Chasing Impossible by Katie McGarry. Happy reading! Thanks for sharing this new-to-me novel. Historical fiction is one of my favorite genres, so I'll be taking a closer look at this book. I like the questions you pose in your opening. I like reading books rear answer the questions. This one looks good. Hmm, interesting intro but, I'm not sure. I like books that make you question how you'd react in a similar situation and as many of my wider family were living in occupied Amsterdam as Jews it would make quite a poignant read.